How many of you remember The Lion King? Well, imagine that crossed with the story of the great flood and you have Thimblerig's Ark. Thimblerig is a lowly groundhog. His entire existence is one con after the next. He is constantly skating through life by the skin of his teeth and narrowly escapes trouble only by his wits and quick thinking on his feet. Until one day he has a bad dream about a great flood and decides to turn it into his greatest scam yet. Soon, all the animals of the forest are entrusting Thimblerig with their life savings of figs, so that he will lead them to safety from the upcoming disaster. Little does our unlikely hero know, but his nightmare of the flood was actually a premonition of things to come sent to him by the fabled Unicorn King. Will Thimblerig be able to lead the animals of the forest to safety? Or will the pack of wild dogs lead by the ruthless Blonger catch and execute everyone during the annual Great Hunt? 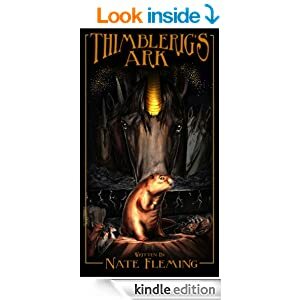 Thimblerig's Ark is a really fun book with lots of action and lovable characters. I found myself picturing many of the animals as those animated in The Lion King-especially the wild dogs that I envisioned to be the hyenas. I found the religion of the animals of the forest to be very intriguing and certainly did ring a bell with regards to parallels between other bible stories. The climatic scene is especially well written and I found the pages flying by as I held my ebook reader with white knuckles, eagerly anticipating the exciting conclusion. Thimblerig's Ark is a breath of fresh air for those that may need a break from more serious reads. So, have yourself one heck of a great time and pick up a copy today! Thanks Janis :-) I appreciate all your help at getting the word out. This sounds like a cute read. I see animated movie in its future. Tweeted it and Pinned it on my supporting fellow authors board. It certainly is. May I introduce you to Nate? Maybe you two can work something out in exchange for a review. That would be great, Elizabeth! Just send me a message with your contact details. Thanks Elizabeth :-) I'm sure if you ask Nate nicely, he would be willing to send you a copy in exchange for a review. I agree with Eric. That does sound like a fun book! :) Just from reading your review, I can imagine what the characters must be like.